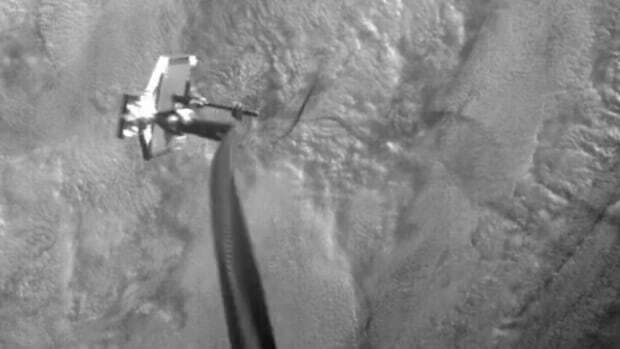 In a British-led experiment, a harpoon flung from a satellite has successfully captured a piece of fake space garbage. No, 'Oumuamua is not an alien spaceship. It might be even weirder. Not to put too fine a point on it, but what the frak is 'Oumuamua? Not a spaceship. Maybe it’s the fractal packing peanuts that the spaceship came in? 7am wake-up and 7pm quitting time? Precisely every 12 hours? Probably instrumentation/interference, one way or another. Not the microwave in the break room, but some component of the lander itself or of one of the science packages does something on a 12 hour cycle. There must be a load of electronics on board that aren’t old school dedicated hardwired systems, but software-defined. Lots of little computers. They’ll all have to meet standards, but even if they would be based on identical hardware (which is unlikely as stuff like the science packages have different jobs each), there would be different versions of operating systems, the odd component with another OS altogether, different drivers, different compiles, code re-use, etc, etc. Even if everything is perfectly up to spec - there is no way to write specifications that really cover everything that can happen in real life, on Mars. Get on it, Happy Mutants! This feature is repetitive and "slightly strange." Currently, the scientists believe the feature must be some kind of atmospheric wave related to sunrise and sunset on Mars. Perhaps there are downslope air flows moving off steep topography, related to the Sun’s movement, that briefly upset the atmospheric changes.